Klyashtornyj S., Sultanov T. States and Peoples of Eurasian Steppes: from Antiquity to Modern Age [Государства и народы Евразийских степей: от древности к Новому времени]. St Petersburg, Peterburgskoe Vostokovedenie Publishers 2009. 432 p. («Orientalia»). The work is dedicated to the problems of provename, ancient and medieval history of nomadic peoples who had inhabited huge territories of Eurasia from the Amur river bassin in the east up to the Danube river in the west. The researchers pay their main attention to the origin and history of the first nomadic empires: Turkic Qa'anates (6—9 centuries), Qarakha-nid and Uyghur states in Central Asia, Bulgar state in the Sea of Azov region, Turkic peoples and tribes within the Mongol empire: the Golden Horde, Kazakh zhuzes and Kazakh kanate. Tribal unions and later peoples speaking Turkic languages formed in the depths of these empires. Long-time history of state sustems of Eurasian nomads is examined in close relation with the history of their neighbours, those from China, Iran, Byzantine and Russ. Turkic state system had created specific forms of religions beliefs and literary culture that created a unique aspect of ancient Turkic civilization. Its history is paid much attention in the monograph as well. An especially complicated problem of genetic ties of ancient Turkic peoples with contemporary Turkic-speaking nations is discussed at such a vast scale for the first time. 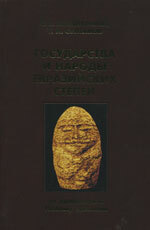 The book has been aimed for lecturers and students if institutions and faculties of humanities, as well as for the vast range of those readers interested in the past of Eurasian peoples.